One of the must important parts of a hip hop or rap beat is the sub bass content. 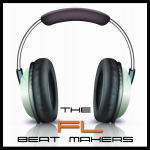 This portion of the instrumental along with the drums will be the driving force and groove of your beats. 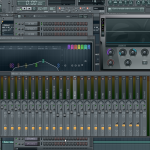 There are various ways to get a good sounding sub bass but today we will focus on making a sub bass with 3xOSC in FL Studio. 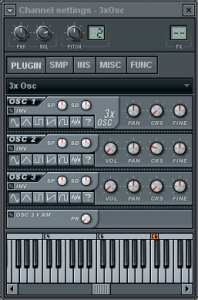 The 3xOSC is a subtractive synthesizer that contains 3-oscillators. The first thing that you will need to do is add a channel to the Channel window and step sequencer. Each channel can be considerend an instrument or sample. To do this click channel Add new and select the 3xOSC. After adding it will appear in the channel window and the channel settings will be found on the right. The channel settings area is where we will make our changes to achieve the sub bass tone we are after. In the channel settings window locate the OSC 2 and OSC 3 sections. 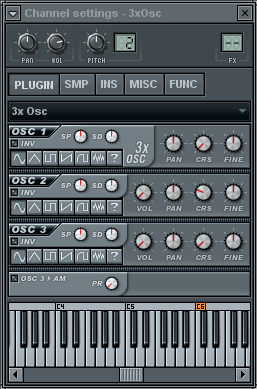 For OSC 2 and OSC 3 turn the volume knob all the way to the left (setting for zero). If you have a midi keyboard connected if you play a note around C2 you will already notice a decent sub bass tone. If you dont have a midi keyboard you can play the keys within the channel window or in the piano roll window. The settings for this step can be found in the image below. Next you want to locate the Course Tuning (CRS) knob for oscillator 1 and turn it all the way to the left. This will drop the pitch by 24 semitones or two octaves. Since we are in the process of making a sub bass with 3xOSC we will not get into all aspects of mixing your sub bass. The focus will be on processing your sub bass from a sound design perspective. Before you can begin apply effects the the sub bass it is necessary to assign it to its own track on the mixer. This can be accomplished by selecting the track and using the keybard command Ctrl + L. The first step that I take when mixing a sound is use a trim plug-in to lower the average rms value of the item to around -18db. This is done to get the instrument at an optimum level for the effects we will be applying to our sub bass. If you do not fully understand this tip or do not have a trim plug-in you have nothing to worry about. This is an additional step I take when approaching any mix. If you want to skip this step just be sure that your sub bass is hitting around the -6db point on the peak meter for the sub bass channel on the mixer. 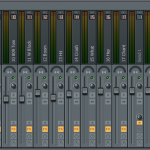 As a side note I also like to remove the default fruity limiter from the master track before approaching a mix. So now we are ready to put the finishing touches to our sub bass. 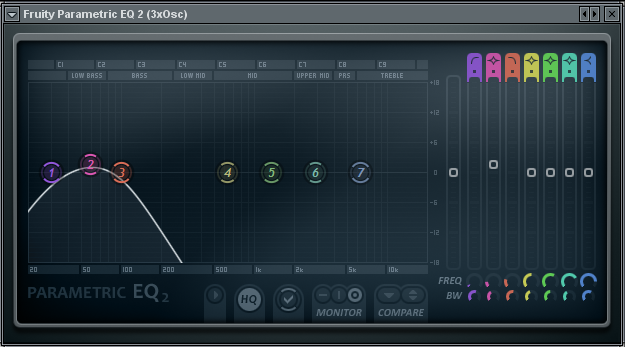 First we want to apply the Fruity parametric EQ 2. 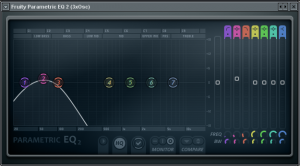 We will use the parametric EQ to get rid of unneccessary frequencies for the sub bass. In this case I will typically filter out with a high pass filter at about 20 to 30 Hz. I will follow this up with a low pass filter and filter out somewhere above 85 to 90 Hz. Next I will use a spectrum analyzer to to ensure my filters have removed all unnecessary frequencies. If I am still getting content in those areas I will apply the same filter to the next slot of my mixer track. Repeat this process until you bass lies only between 30 to 85 Hz. Now lets apply a little boost to our bass using the FL Bass boost plug-in. This will add a slight enhancement to the bass with a gentle boost. 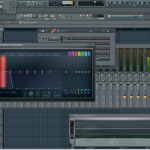 If you want to give your sub bass tone a little more depth add the strereo widener effect within FL Studio. As a final enhancment I like to use add an exciter to the effects chain. In this case Izotope Ozone 4 will be used to achieve the desired effect. Once all effects have been applied and I am happy with the end result I will again apply my trim plug-in to make the audio hit around the -18db average rms level. As mentioned above if you dont have a plug-in of this kind, just make sure your peak meter for the sub bass mixer channel is somewhere around -6db. am so happy for this tutorial. i am now making success with my base line than i used to.